The following information should answer your questions about these barn and garage plans. If not, you're very welcome to order the plans, review them at your convenience, show them to your contractor or building department and then return them at any time for a full refund if they don't meet your needs. 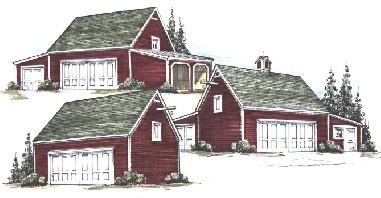 All of the designs in the Pine series of barns, garages, coach houses and workshops can be built from the same set of plans. You'll receive detailed construction drawings for a 24'x24' Main Garage/Barn with pull-down stairs to a 24'x24' Loft. You'll also receive plans for a variety of optional sheds that can extend the Main building on either side and across the back. Build a 24'x24' two-bay garage, barn or workshop now. Then add extra parking bays on the sides or across the back. Or, add an easy-to-build storage space, studio, tractor shelter or woodshed. Or, add a shed across the back to extend your garage for big vehicles, boats or trailers. Build small now and then expand your building as your needs grow. Or, build exactly the layout you need right away. You can customize your building with your choice of layouts and your selection of exterior materials. Blueprints, by architect Don Berg, include all the drawings you'll need to build any of seven sample designs that are shown on those plans, or you can create your own custom building layout. Areas: Floor Area of Main Garage/Barn - 576 Sq.Ft., Floor Area of Storage Loft - 576 Sq.Ft. Add-On Sheds: Sheds and 12'x12' (144 Sq.Ft. ), 12'x18' (216 Sq.Ft. ), 12'x24' (288 Sq. Ft), 10'x18' (180 Sq.Ft. )and 10'x24' (240 Sq.Ft). They are designed for use as additional storage space, open shelters, carports, garages, tractor shelters, workshops, garden sheds, open equipment shelters and woodsheds, and are planned to be easy-to-build on either side of the Main Garage/Barn, or across the back. They may be built at the same time as the main barn, as shown in the various sample designs, or added later as your needs grow. Doors: The two sliding doors on the front of the Main Garage each open 8'-4"" wide and 8' high. The garage doors on the add-ons open 8' wide and 7' high. Overhead doors may be substituted for all sliding barn doors and hinged garage doors shown on the plans. Construction & Finishes: These garages, sheds and barns are designed to provide you with inexpensive parking and storage space, the look of traditional country outbuildings and the best quality modern construction. All of the materials shown on the website illustrations are just suggestions. These buildings can be constructed with any of a variety of exterior finishes and details so that they can match your home or other buildings on your property. The plans are all designed for post-frame construction. That's the modern version of "pole-barn" construction, using pressure treated 6x6 posts as the main structure and post hole or concrete pier footings. Post-frame construction eliminates the need for full foundations and can save you as much as 20% of the cost of construction by reducing the amount of site work, excavation and concrete needed. Pressure treated posts are rated for years of use. However, their life is affected by the moisture and mineral content of your soil. Commercial plastic-sleeve post protectors and concrete post bases will extend the life of your building. You'll find information on some of the most popular ones here: Barn Building Resources. The drawings include details for plastic sleeve post protectors and for optional concrete pier footings which keep all wood away from the ground. Plastic sleeve post protectors or concrete pier footings are recommended for moist areas, areas of clay soil and, in all locations, for maximum building life. Loft floor construction is by conventional wood joists. Roofs are framed with wood rafters, not space-wasting trusses, to allow full use of loft storage space. Loft gable-end walls are framed with wood studs. Grade level floors can be gravel, tamped earth, or concrete. Concrete floor slabs must be poured after the posts are standing. These buildings can't be built on existing slabs. Do-it-yourself? : The drawings are intended for experienced builders and use standard methods, abbreviations and symbols. They do not include step-by-step building directions. These are fairly large buildings and are not recommended for first-time builders. Building Codes: The plans meet or exceed most national standards and code requirements. The pole framing is engineered to the standards established by the Northeast Regional Agricultural Engineering Service at Cornell University. The designs also meet or exceed the requirements of the national ICBO Code for type S and U buildings, if built no closer than 5' to an adjacent combustible building. The plans are easily modified to meet Residential Accessory building standards by using code-compliant egress doors. The drawings come with a New York State architectural seal. However, like all stock plans, these drawings should be reviewed and modified by a local construction engineer for use in areas with higher wind load requirements, for earthquake resistance requirements, higher snow load requirements and poor or poorly drained soil conditions. California, Pacific Coast and Rocky Mountain locations may necessitate modifications to meet earthquake resistance requirements. High mountain locations and areas of Alaska, Canada, northern Maine and northern Michigan may require higher snow load resistance. Florida, Long Island, coastal areas, high mountain areas and some other locations will require higher wind load resistance. Many northern locations will require deeper post footings because of deeper frost penetration. The states of Florida and Nevada, the province of Ontario and some local jurisdictions require that drawings be prepared or reviewed by an in-state architect or engineer. Some local building officials will wave some requirement if the building is planned for agricultural use or for property that is zoned as Agricultural. Check with your building department. Construction Cost: Post-frame (pole-barn) construction generally costs 20% less than conventional stud frame construction because continuous footings are not necessary and because site work is reduced. Built by a contractor, the Main Barn/Garage can cost from as little as $16,000 to more than $32,000 depending on your location, the season, your site, and your choice of materials and options. Add-on sheds can cost less than $3,000 for the smallest open shelter to over $12,000 for a 12'x24' garage and workshop. Material cost alone should be about half the range of these prices. Use your blueprints to get accurate estimates from contractors and building supply centers in your area. Changes to the standard designs: You can customize your building by choosing the exterior materials and add-ons that you want. The designs shown on the drawings and website illustrations are just a few samples of the many layouts and looks you can build from the standard drawings. In addition, other changes are fairly simple and can be done during construction by an experienced contractor. Adding or eliminating doors and windows and substituting overhead doors for sliding barn doors are changes that can be done by your contractor. We can't provide modifications to the standard drawings. However, you're very welcome to pass the drawings to an architect or construction engineer in your area for those modifications. Architect Donald Berg's designs, interviews and articles have appeared in Home Magazine, Traditional Building Magazine, The Old House Journal, Better Homes and Gardens, Country Magazine, Equine Journal, Country Extra, Yankee Home, Hudson Valley Magazine, Period Homes Magazine, Mother Earth News and many other publications. He's been a guest and consultant on HGTV and has published fifteen books on traditional American country building and landscape design. Why you need blueprints: Accurate construction drawings will save you many times their cost. Use them to get competitive bids from a number of different contractors. Take a set to your favorite building supply center or lumber yard for a computerized materials price list. Then, substitute other materials to compare your savings. Your contractor will save time and expense in construction because details are worked-out in advance. You'll have the right documents to present to your building department, zoning board or community's building reviewers to get their approval before you start construction. Since the drawings are for utilitarian storage spaces, they don't include details for insulation, interior finishes, electricity or plumbing. If needed, these can be added by a local building professional. Material Lists: Because these buildings were designed to be built with any of a variety of exterior finishes and with optional layouts, material lists can not be prepared in advance. Many home centers and lumber yards will provide you with a computerized material list and prices, from the construction plans, after you've chosen the exterior materials and options that you want. Options and Optional Finishes: Sources for cupolas, weathervanes, barn and carriage house doors, rolling track hardware, stall partitions, post mounts, post protectors and special construction items can be found here: Barn Building Resources. Shipping: We try to process all plan orders within four days and ship by three-day First Class or Priority Mail. Please allow two weeks for delivery to Hawaii, Alaska and Canada. How many sets of plans will you need? : These drawings are copyright protected and may not be reproduced in any way. Most people need at least three sets of drawings. You may need to supply drawings to your building department, zoning board, community review board and building supply center. You may also need extra sets to get competitive bids from contractors and subcontractors. Additional sets of plans always save more than their cost in your savings from competitive bidding. Order Now: Plans are $59.00 plus $5.00 for shipping, for three complete sets of drawings. The plans come with a complete money-back guarantee and include a variety of optional add-on sheds, shops, garages and carports that help you build any of seven standard layouts, including the one shown above. All seven of the standard layouts are shown on the plans you'll receive. You can build any of them, or you can use the main building plans and any of the add-ons to create your own custom design.